Today we’ll cover another objective towards VCP-DCV 2019 Certification. We have started to work on a new Study Guide that we call VCP6.7-DCV Study Guide. 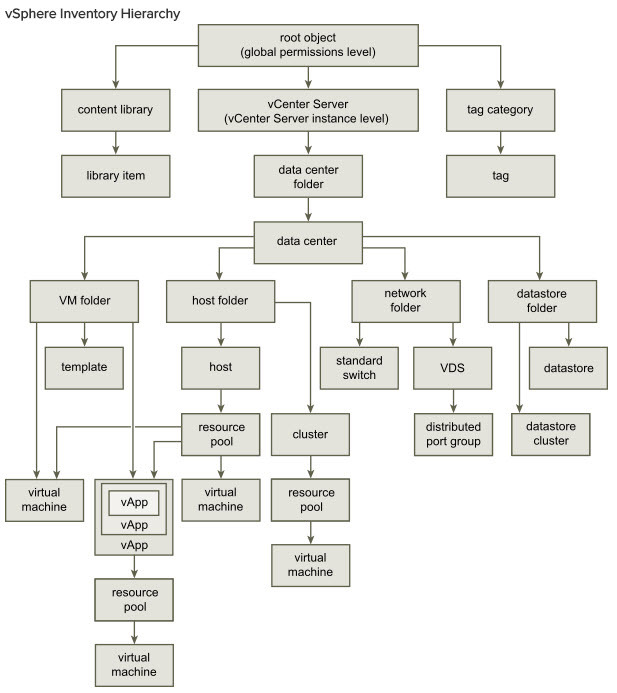 Today’s post is about VCP6.7-DCV Objective 7.12 – Setup permissions on datastores, clusters, vCenter, and hosts. An interesting chapter, important to know how to restrict and protect vCenter assets. We won’t be able to cover everything in a single post – make sure to read the PDF documentation to know everything inside out for the exam. 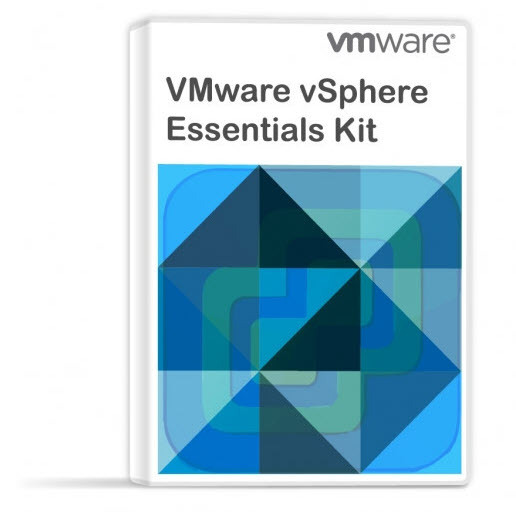 The VMware Exam blueprint has 41 chapters (Objectives). VCP-DCV 2019 certification is the latest certification based on vSphere 6.7. In case you don’t know, VMware changed the rules of re-certification recently. Our Post: VMware Certification Changes in 2019 has the details. No mandatory recertification after 2 years. Older certification holders (up to VCP5) can pass the new exam without a mandatory course, only recommended courses are listed). Privileges are fine-grained access controls. You can group those privileges into roles, which you can then map to users or groups. The permission model for vCenter Server systems basically allows you to assign permissions to objects in the object hierarchy. Each permission gives one user or group a set of privileges, that is, a role for a selected object. For example, you can select a virtual machine and select Add Permission to assign a role to a group of users in a domain that you select. That role gives those users the corresponding privileges on the VM. After assigning permission to an object, on the same page you can check the box to propagate permissions down the object hierarchy. You have to set the propagation for each permission. (or not). Permissions defined for a child object always override the permissions that are propagated from parent objects. Differences between permissions, privileges, users and groups and roles. Privileges – access controls to the resource. You group privileges into roles, which are mapped to users or groups. Users and groups – pretty obvious. Only users authenticated through Single Sign-ON (SSO) can be given some privileges. Users must be defined within the SSO or users from external identity sources such as Microsoft AD. Roles – what is a role? A role allows you to assign permission to an object. Administrator, Resource Pool administrator, etc are predefined roles. You can clone them or change them (except Administrator). When you assign permission to an object, you can choose whether the permission propagates down the object hierarchy. You set propagation for each permission. Propagation is not universally applied. 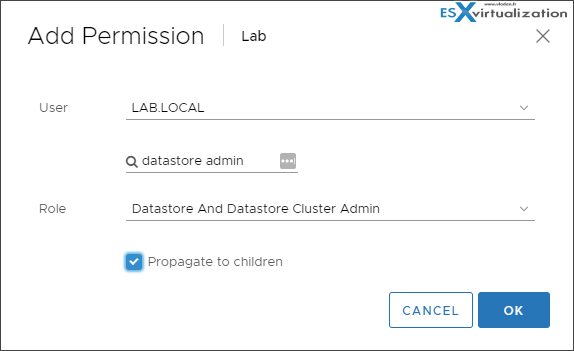 Permissions defined for a child object always override the permissions that are propagated from parent objects. 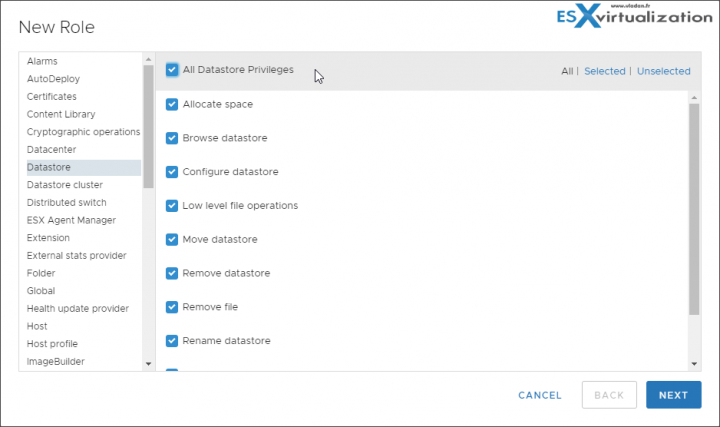 Datastore privileges control the ability to browse, manage, and allocate space on datastores. You can set this privilege at different levels in the hierarchy. For example, if you set a privilege at the folder level, you can propagate the privilege to one or more objects within the folder. The object listed in the Required On column must have the privilege set, either directly or inherited. Folder privileges control the ability to create and manage folders. You can set this privilege at different levels in the hierarchy. For example, if you set a privilege at the folder level, you can propagate the privilege to one or more objects within the folder. The object listed in the Required On column must have the privilege set, either directly or inherited. Browse to the object for which you want to assign permissions in the vSphere Client object navigator. Click the Permissions tab > Click the Add Permission icon > Select the user or group that will have the privileges defined by the selected role. From the User drop-down menu, select the domain for the user or group. Type a name in the Search box. The system searches user names and group names > Select the user or group > Select a role from the Role drop-down menu. (Optional) To propagate the permissions, select the Propagate to children check box. The role is applied to the selected object and propagates to the child objects. Click OK to add the permission. So here is an example of the whole process. 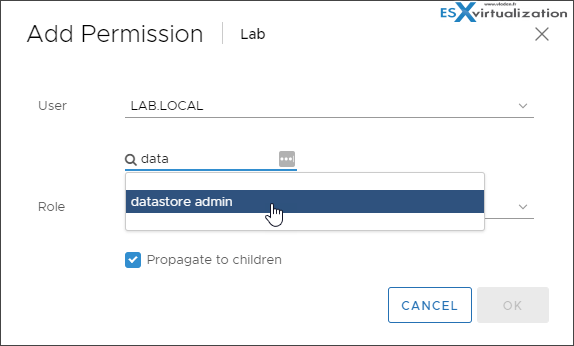 For example, you want to assign a role to a datastore object. First go to vSphere Client > Administration > Roles > Create a role > chose from the categories of privileges you want to create a role. Then select the object where you want to assign permissions by selecting the role. Chose the domain at the first drop-down menu. Start typing a name of group (in my case I have created a group called datastore admin in my Microsoft active directory (AD) first, and then added some users to this group). It populates automatically. And then pick the role via the drop-down menu.